This kid-friendly bread is great for using up leftover eggs and ideal for anyone on a paleo diet who is craving bread. 1. Roughly chop the Brussels sprouts, herbs and garlic. Add to a blender with the gherkins, mustard and salt and blitz to combine. Slowly pour in the olive oil and lemon juice, blending on pulse as you go. Transfer the sauce to a jar with a lid. 2. Preheat the oven to 150°C/ gas mark 2. 3. To make the bread, whisk the egg whites in a large bowl using an electric beater until stiff peaks form. Put the egg yolks, cream cheese and cream of tartar in a separate bowl and whisk together until pale and frothy. Gently fold the egg whites and cumin seeds into the egg yolk mix, trying not to knock out too much air. 4. Carefully dollop the mixture into four mounds on silicone baking sheets or two baking sheets lined with oiled tin foil, shiny side up. Bake for 20 minutes, until lightly golden and craggy on top. Allow to cool for a few moments before carefully removing from the sheet with a palette knife. 5. 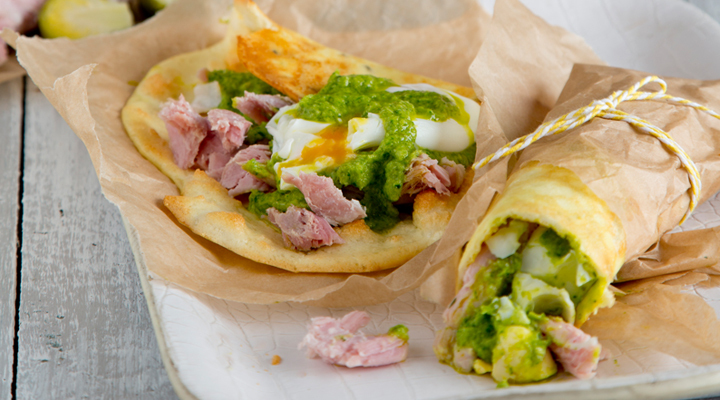 Top each warm bread with a slice of ham and an egg and drizzle over the green sauce.